What Was Going On Between Reddit's Alexis Ohanian And Stratfor? On Monday, the social media website Reddit was abuzz with discussions and questions regarding an email exchange between the site’s co-founder Alexis Ohanian and the intelligence contractor Stratfor, which had been released to the public by WikiLeaks. The email thread, which appears to have been initiated by Ohanian himself in January 2011, has as its subject line: “reddit cofounder consulting for Stratfor to bring in the social media dollars.” The email was addressed to Meredith Friedman, the VP of Communications for Stratfor. He’s a huge Strafor fan and he and I chatted while George was doing his interview on Bloomberg TV then he and George met and talked about doing something with reddit for social media. We invited him to visit Stratfor when he’s in Austin for South-By-Southwest in March. Geroge can fill you in more on his thinking but I wanted you to see we’d made this initial contact and think about how to capitalize on a relationship with Reddit. After graduating from the University of Virginia in 2005, Ohanian started Reddit with Steve Huffman. Initially the site was funded by Y Combinator, who was later bought out by Condé Nast. Ohanian left Reddit in 2009 and in September 2010 announced he had joined the Y Combinator team, amid speculation that Y Combinator was a stepping stone used to build up the Reddit readership. Today Reddit’s readership comprises around 69.9 million monthly users. The site is famous for breaking news, but also has caused controversy, such as when users on the site investigated and propagated photos of the Boston bombing incident. Members on the site identified the wrong person as the bomber, resulting in many journalists and law enforcement officials inadvertently smearing an innocent — and, as it were, deceased — person’s name. 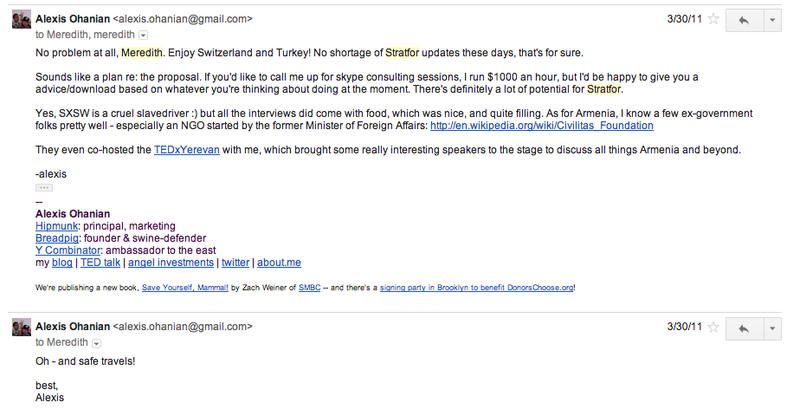 Ohanian has not explained why he wanted to work for Stratfor, but these emails appear to indicate he merely was trying to expand his resume and professional network. – This includes twitter, facebook, youtube, blogs, forums, social news, podcasts, etc. Moving forward, assuming you love our expertise as much as we think you will, we’d be open to discussing consulting services on retainer. She responded, thanking Ohanian for his proposal, but said they would have to reconsider it at a later date. Not wanting to lose his potential working relationship with Stratfor, Ohanian responded that he was available for Skype consulting sessions at $1,000 an hour, “but I’d be happy to give you advice/download based on whatever you’re thinking about doing at the moment. “There’s definitely a lot of potential for Statfor,” he wrote. I have never consulted for Stratfor. Ohanian said that his excitement to work with Stratfor was before WikiLeaks revealed anything about the company, so he wasn’t aware of the company’s more nefarious activities. After the email revelations, Ohanian tweeted that in 2007 he was paid to speak about new media at Booz Allen Hamilton, a government contracting giant and former employer of National Security Agency whistleblower Edward Snowden.